Video of a controversial arrest of a Raleigh man has been released by the North Carolina Highway Patrol. The deputy is heard telling his K-9 "get him. Get him," as the dog is unleashed, and leaps onto Hinton. RALEIGH, NC (WNCN) - Authorities have released video showing a Raleigh man's April 3 arrest that led to three law enforcement officers facing charges. Kyron Hinton said he was beaten by police during his arrest on Raleigh Boulevard on April 3. On Wednesday, 10 dash camera videos and one body camera video were released by Raleigh police, the North Carolina State Highway Patrol and Wake County Sheriff's Office. A Highway Patrol dash camera rolls as a trooper pulls onto Raleigh Boulevard shortly after 10:30 p.m. As the trooper pulls up, Hinton is standing in the middle of the street. He appears to be yelling. In the video, the trooper gets out and asks Hinton if he's alright. Multiple dash camera videos capture Raleigh police officers arrive, get out of their cars, and approach Hinton, forming a circle around him. The dash camera videos and the civilian's footage appear to show at least one officer talking to Hinton. At 10:38 p.m., a Raleigh Police dash camera video shows a Wake County Sheriff's deputy and his K-9 approach Hinton. In several clips, the deputy can be heard warning Hinton "get on the ground or you're going to get bit." He then is heard telling K-9, Loki, "get him. Get him," as the dog is unleashed, and leaps onto Hinton. The videos appear to show the deputy punch Hinton as he is taken to the ground. Over the next five minutes, there is a struggle on the ground as officers try to place Hinton under arrest. In several videos, Hinton is heard moaning and yelling as officers tell him to put his hands behind his back. In a trooper's dash camera video, someone can be heard yelling "let go of my dog," and "he's not stopping resisting." The videos continue to roll as the struggle ends, and EMS arrives while Hinton is still on the ground. 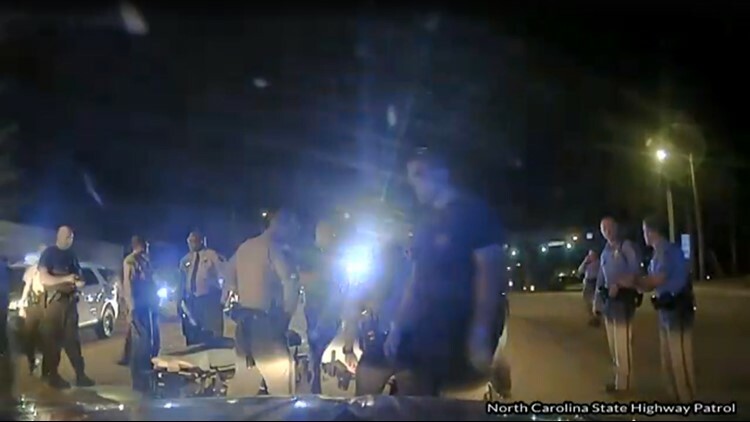 In the sole body camera video, a Wake County deputy arrives and walks up to the K-9 handler, identifying him as Cameron Broadwell, and asking if he's all right. Broadwell: Yeah, my radio broke when I punched him in the face. Deputy: OK, OK, hey, hey. Broadwell: It's fine. I gave him a chance to get on the ground, put his hands up because he hadn't been patted down. The videos end as EMS arrive to bring Hinton to the hospital. Following the release, supporters of Hinton spoke out. "Let us thank God that another black man was not killed by an obviously poorly trained, poorly disciplined state trooper and two other officers," said T. Anthony Spearman with the North Carolina NAACP. "One thing is clear to us that police cannot continue to police police." Diana Powell with Justice Served Raleigh said Hinton is suffering and is scared to be out in public. "We want to let the world know that we have a voice and we will not be silent. We have a right to be angry. We have a right to be mad," Powell said. "He’s suffering, deeply. He doesn’t know if he can walk out in the street and not encounter law enforcement again." Court documents show he spent four days at WakeMed before being brought to jail. On May 15, two state troopers, Tabitha Davis and Michael G. Blake, were indicted on assault with deadly weapon with intent to inflict serious injury, and willfully failing to discharge duties in connection with Hinton's arrest. The K-9 deputy, Cameron Broadwell, was indicted for willfully failing to discharge duties, assault with deadly weapon with intent to inflict serious injury, and assault inflicting serious bodily injury. They are due back in court June 11. In 911 calls from April 3, several people called to report an armed man standing in the street. "He's screaming something and he's holding a gun or what definitely looks like a gun," one caller said. "I guess I figured just to let cops know in case it is a gun." Hinton says he was not armed. According to warrants from Hinton's arrest, he ignored commands to get on the ground and physically resisted when the officers hit the K-9, Loki, in the head and face. He was charged with three misdemeanors: disorderly conduct, resisting a public officer, and assault on a law enforcement animal. The Wake County district attorney dismissed those charges May 7.